We have an active, goal-oriented population here at SSOR and of course, our folks get injured doing activities they love, but also during normal daily life. One injury that we see from time to time is a separated shoulder. A separated shoulder is a painful injury and can significantly restrict use of your arm for even simple things like reaching for a glass or washing your hair. For many people, these injuries can be managed non-operatively, but in more severe cases, surgical reconstruction is needed. So what’s the deal with separated shoulders? A separated shoulder is a disruption of the ligaments that connect your clavicle (“collar bone”) to the scapula (“shoulder blade”). 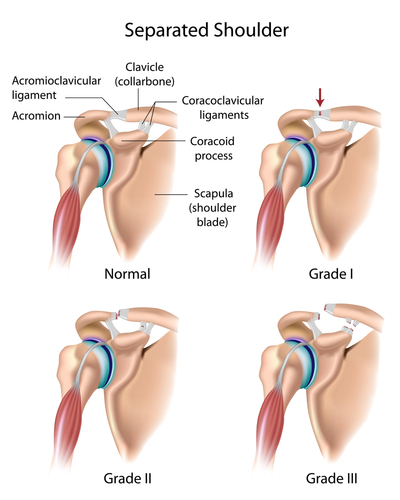 The joint of those two bones is called the Acromioclavicular (AC) joint, and this is the joint that is “separated” when you suffer this injury. What are the causes of a separated shoulder? Shoulder separations are normally a contact injury in sports (tackling, hitting the boards in ice hockey, skiers falling on their shoulder) or for “regular Joe’s,” falling directly on the shoulder can cause a separated shoulder, as in a fall from a ladder. These injuries are typically higher velocity/higher impact injuries. These two terms are often used interchangeably and they are vastly different. A shoulder dislocation is an actual dislocation of the shoulder joint, the Glenohumeral joint. Here, the humeral head is no longer in contact with the glenoid fossa that it sits on. Put another way, imagine a golf ball sliding off the golf tee. As you can see from the picture, this is a very different injury with an entirely different rehab process. Normally, a person who has this injury needs an X-ray and potentially an MRI to determine how severe the injury is. There are different grades of AC injuries. Most are managed non-operatively, but in more severe cases, a reconstruction of the AC joint is warranted. Once physical therapy begins, a progressive program of range of motion exercises are done until full range is achieved, then strengthening of the shoulder takes place after that. People who suffer this injury do well long-term without much problems, provided they see the rehab through. 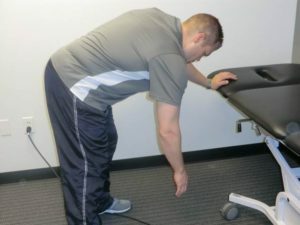 Sometimes pushing/pressing overhead can cause some discomfort and sleeping on that shoulder can cause some discomfort, but by and large, this injury isn’t a big deal if it isn’t a severe one. Sometimes for more moderate shoulder separations, you may actually see that your collarbone isn’t even or looks elevated in the mirror. Really, this is more cosmetic and is not typically a problem and is just a result of the injury. This may only be a problem if you’re a swimsuit model and want to look “symmetrical” with your shirt off! Otherwise, no big deal. Pendulum exercise to help reduce pain and stiffness. Cane press. Lay on your back and press a cane towards the ceiling. Depending on severity, this may really hurt, so proceed with caution. 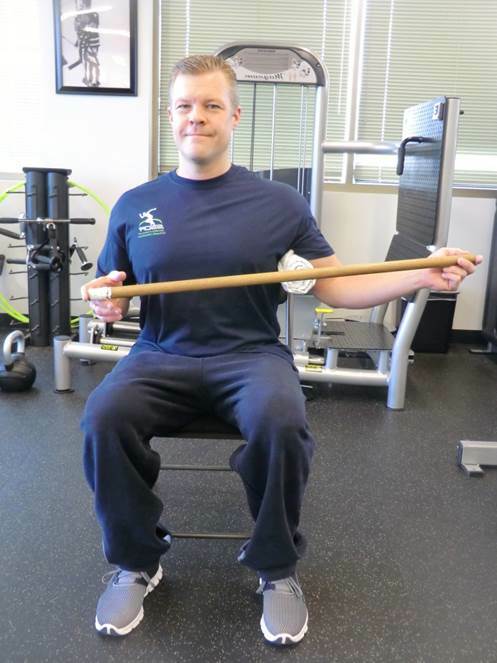 Internal/External Rotation. Sit up straight and place a rolled towel in your armpit. 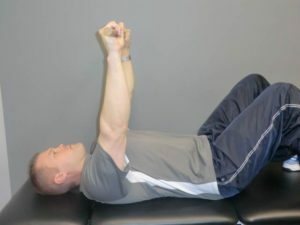 Use the uninvolved arm to move the arm in/out. We are confident that we can help you with your separated shoulder. It would be a privilege to serve you and partner with you in your care. Give us a call!